Located 1 hour from Belfast on the shores of Strangford Lough, visitors to Exploris Aquarium in Portaferry will be wowed with a diver’s view of marine life around the world. Your journey will begin with a focus on the lough and Irish Sea where you will get a ‘hands on’ with our native species as you tickle the belly of a small shark and feel the spikes on a sea urchin, along with learning about the Viking heritage of Strangford Lough. Outside in the enclosures our family of Asian Short Clawed Otters remain a big hit with visitors, while the Seal Sanctuary continues to be exceptionally busy. Make sure to grab your expedition passport before you set off on your journey through the zones where you will meet our clownfish, sharks, rays and much more. Keep look out for the stamping stations, answer the trivia questions and stamp your passport as you go! Complete your expedition passport and your hard work will be rewarded with a piece of ‘treasure’ which you can collect from our gift shop! Whilst at Exploris don’t forget to explore Jiggly Jellies, a two tier aquatic themed indoor soft play area with distinct zones for babies, toddlers and juniors up to 8 years old. Jiggly Jellies is packed with a numerous exciting features including slides, ball pools, climbers, swings and roller squeezers and is guaranteed to provide endless fun for the little ones. 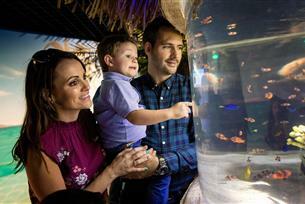 Exploris Aquarium is open daily from 10:00 – 17:00. Pre-book your tickets online at explorisni.com for discount. Please see www.explorisni.com/events for further details.